Well before 1982, Larry Walters had a dream. Larry wanted to be a pilot. He wanted to soar above the earth on wings of steal and see life like a giant standing above an anthill. He spent his teenage years dreaming and planning…and when he came of age, took the test to become a pilot in the US Air Force. Alas, a dream does not a reality make. Due to his poor eyesight, Larry was unable to get his pilot’s license. For an average human…a simple pivot would happen. A resolve to the new dream or dreamless way of life would shift into focus. But not for Larry. For the Larry…the goal to glide with the birds was never stronger…and never faded. He began thinking up NEW methods of flight. NEW ways to, come hell or high water, see his dreams become a reality. Larry came to the realization, in 1982, that he was going to have to think outside of the proverbial box (or airplane). SO, drawing on his childhood memories…he thought up a master plan (later inspiring a Pixar movie) that would go on to make national news. The plan? Pack a few sandwiches and a pellet gun into an Igloo lunchbox, Inflate 42 weather balloons with helium, STRAP said balloons to a lawn chair…and enlist the help of his friends and girlfriend to launch him into the stratosphere. Shockingly…the only thing that went wrong was the pellet gun. 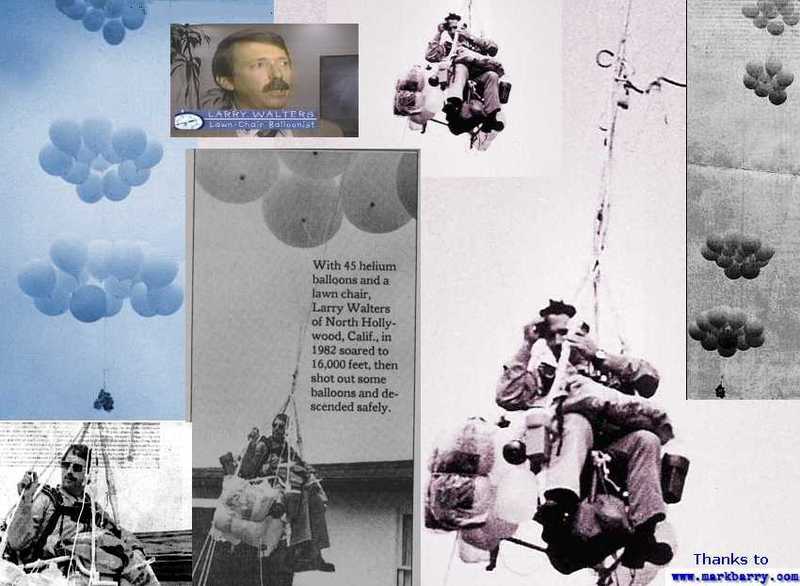 Larry found himself 16,000 feet in the air…and floating inside the LA Airfield. Through the crippling terror, he managed to shoot two balloons before accidentally dropping his pellet gun into the abyss below.Fortunately, gravity and mother nature gave him a helping hand…and after two hours, the balloons slowly began to deflate…lowering Lawnchair Larry safely and slowly to the ground. Some (most) might call his dream completely ridiculous…but entrepreneurs are passionate people. We might wager an entire year’s income on the success of a stuffed animal company…which makes “seeing if a lawn chair can fly” seem a little tamer. That day, Larry new only two emotions…Fear and Fulfillment. And today, I don’t know about you, but I can relate to his lawn chair escapades. As a business owner, I launch my own weather balloon contraption EVERY morning…sometimes with fear…but always with fulfillment. Love this story. We know we need to be brave, so this is just what we needed! I love this too 🙂 thank you for sharing! Thank you for sharing this fantastic story, I can totally relate. Certain things about us entrepreneurs make no sense to the world but it doesn’t have to!